Posted in Staff Blog | Comments Off on Interning on the Bays: How My Experience with the Center Sparked a Passion! As the holidays come to an end and we are forced to fully embrace the winter months, warmer thoughts of spring are certainly welcome. Especially, when they involve creating 62 acres of habitat for spring migrating songbirds, butterflies, and other pollinators that flourish within the Inland Bays Watershed. This spring, the Center will be busy implementing 3 major reforestation projects. Scheduled for Friday, March 29th and Saturday, March 30th volunteers will help to plant over 3,800 seedlings within the Assawoman Wildlife Area in Bethany off of Double Bridges Road. Prior to reforestation efforts, the site was farmed and used recreationally for hunting. By converting to a native mixed hardwood forest and pollinator meadow, the site will no longer require heavy use of fertilizer thereby directly reducing nutrient loads and improving water quality. 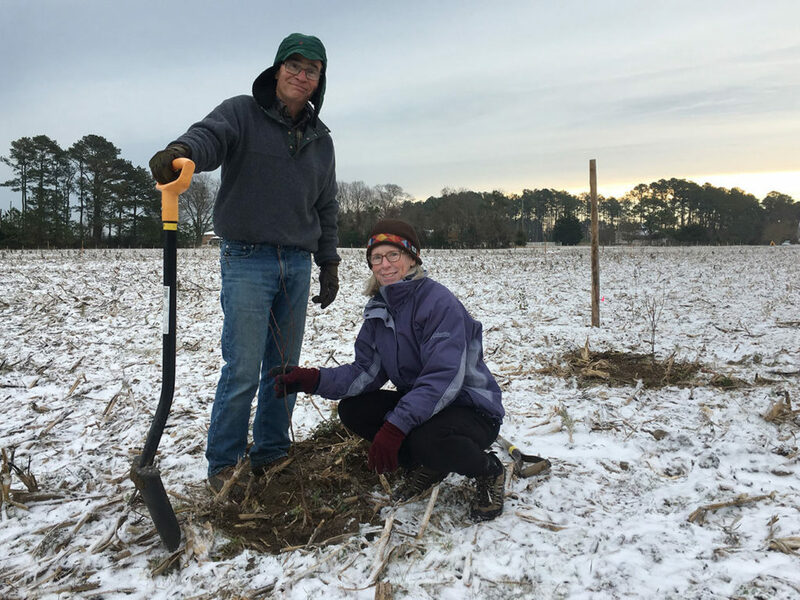 Volunteers work hard during a reforestation project at the James Farm in Fall 2018. This project along with the others was selected using our Watershed Reforestation Model, a watershed approach to identifying both publicly and privately owned agricultural lands that would significantly reduce nutrient loads and improve wildlife habitat within the State’s most rapidly urbanizing watershed. Parcels were “ranked” based on factors such as proximity to small streams, proximity to the Delaware Ecological Network, proximity to groundwater recharge areas, proximity to already protected natural areas, etc. The second volunteer planted project will take place on Saturday, April 6th at a County Landfill buffer site off of Dorman Road in Angola. In addition to the conversion of 7 acres from crops to forested area, 4.8 acres of interior forest will be created. Interior forest is the unfragmented portion of forests that sensitive species rely on to nest and find refuge. Forestland in Delaware has experienced a rapid decline in recent years. Historically, this loss stemmed from conversion to agriculture but is now mostly the result of residential and commercial development and associated infrastructure. According to the 2016 State of the Delaware Inland Bays, from 1992 to 2012 upland forests decreased by 14 square miles in the Inland Bays watershed. Reforestation is more than a feel-good opportunity: It’s important work that protects and extends vital habitats in our watershed. Lastly, the final project will be a conversion of cropland to 20 acres of mixed hardwood forest and 8 acres of pollinator meadow within the Delaware Department of Natural Resources Midland Wildlife Area. This project will be contractor planted due to its large size and lack of accessibility of volunteers. In total, these three projects will reduce 906 lbs of nitrogen and 22 lbs of phosphorus from entering waterways each year. Over 44 acres of interior forests will be created and 67,766,799 lbs of carbon will be sequestered over the next 20 years. Over the next few years, the remaining 8 projects within the Watershed Reforestation Plan will be implemented, helping to achieve the Pollution Control Strategy for the Inland Bays Watershed. 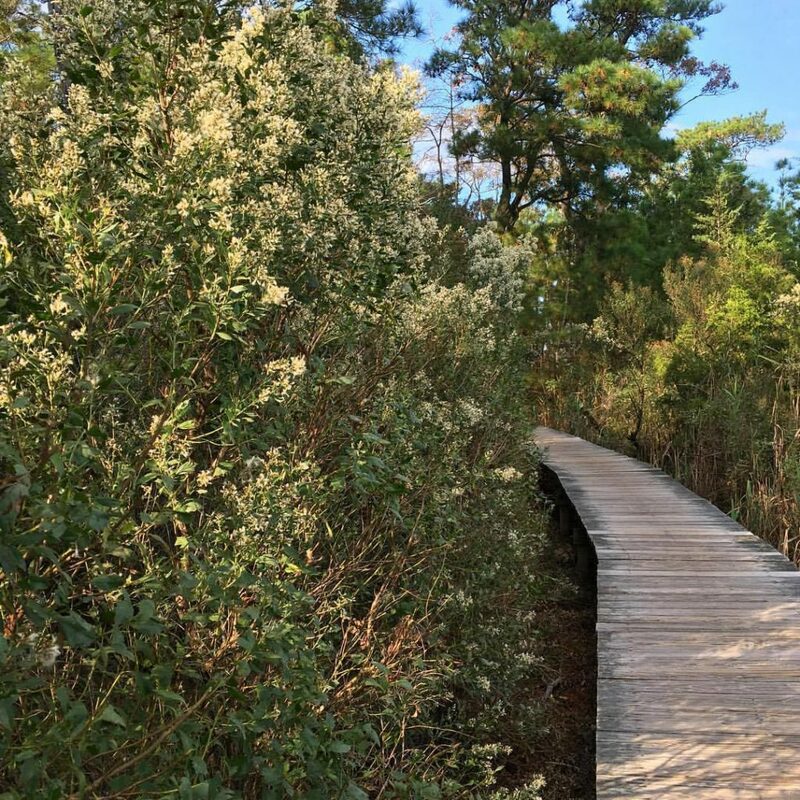 Just off the beaten path and away from the hustle and bustle of Bethany Beach, lies a hidden oasis unknown to many of the tourists and locals that visit the shores of the Inland Bays: the James Farm Ecological Preserve. Whether you go for a stroll in the meadow or head down the red trail and into the maritime forest, you will be struck by the Preserve’s extraordinary diversity. From salt marshes, to hardwood forests, to meadows that were once farm fields…the Preserve has something for everyone! 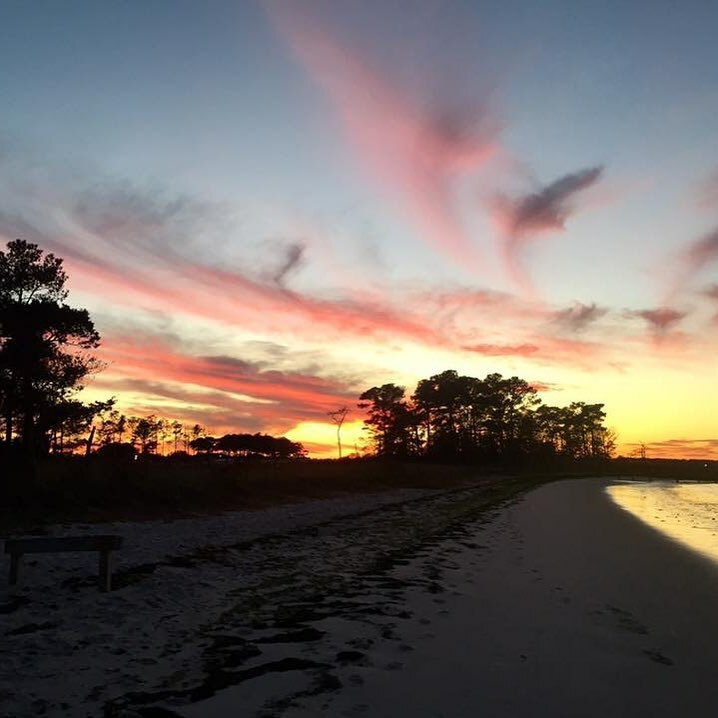 The Preserve’s red trail will lead you through maritime forest and saltmarsh to a pristine sandy beach. In early fall, the bay water is clear, and schools of mummichogs (a small brackish water fish) swim around your feet. Just a little further out into the water, a horseshoe crab with barnacles attached to its shell scuttles past, eagerly searching for a meal of mollusks, crustaceans, or worms. As you gaze out across Indian River Bay, the view stretches for miles. But unlike the housing developments, businesses, and marinas, the beach on which you stand has been mostly left to nature. The James Farm Ecological Preserve is a special slice of Delmarva: an educational and recreational site that gives visitors insight into what the Inland Bays looked like in the past: vast landscapes of varying habitats once untouched by human hands. The Preserve is peaceful and quiet, providing visitors with the experience of being enveloped in nature. The patient visitor can observe songbirds, osprey, wild turkeys, deer, and horseshoe crabs in their natural habitat. Unfortunately, due to a population explosion in the Inland Bays watershed over the past few decades, many natural areas like this have vanished. Gone are the vast landscapes and countless native animals. Instead we now see highways, buildings, and other obvious signs of human civilization. And while these changes are inevitable, the protected Preserve offers a wonderful opportunity for people to glimpse the past in contrast to the present. The James Farm Ecological Preserve also serves as an example — a model for the protection of the marshes and forests that still remain in the Inland Bays watershed. The Preserve acts as a living classroom for local students, a sanctuary for native animals, and a place where adults and children alike can explore the natural world around them. It’s a chance to take a break from the stresses of the modern world and recenter yourself in nature. On November 16, the Delaware Center for the Inland Bays broke ground to implement the James Farm Ecological Preserve Master Plan, a community-developed initiative designed to protect the Preserve’s diverse collection of ecosystems, while safely accommodating and educating a growing number of visitors. This Plan guides the next 20 years of management to preserve its special natural lands and lights the way for future generations to safely enjoy this ecological treasure. The Center is now working to raise funds for the second phase of the Plan. For information about how you can help, visit www.inlandbays.org/JamesFarm. Fall can be the best time of the year for fishing in Delaware’s Inland Bays. Falling temperatures trigger resident and migratory fishes to feed in earnest prior to either migration to the south or further offshore. 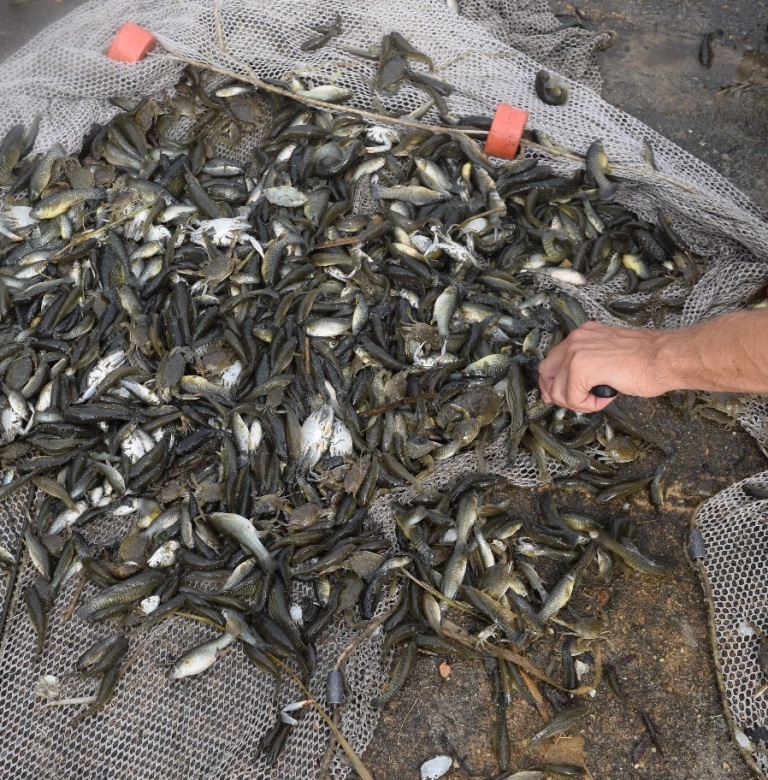 Migratory forage (bait-size) fishes like striped and white mullet and juvenile Atlantic menhaden that have spent the summer in the Inland Bays will be concentrating in larger schools preparatory to moving out through Indian River Inlet and south along the coast line. The mullet run will be closely followed by migratory game fishes like striped bass and bluefish. These schools of migratory bait as well as those bait species that do not normally leave the Inland Bays like Atlantic silversides, mummichog, striped killifish, and bay anchovy, are especially enticing to predators like striped bass and bluefish in the fall as these predators feel a biological compulsion to put on weight before colder temperatures slow their metabolic rates. These striped bass and bluefish will gravitate toward Indian River Inlet and often will hold along structure in the Inlet until late in the fall, feeding and fattening up on the abundant schools of bait-size fishes. The Center’s own Dr. Marianne Walch with a striped bass caught at the Indian River Inlet. Anglers count on these predators to show up in the Inlet at this time of year and target them both from boats and along the Inlet rock bulkheads. Veteran anglers rely on deer hair bucktails and soft plastic crank baits to temp the striped bass and bluefish, as well as natural baits like small spot and live or dead mullet. In addition falling temperatures and shorter days trigger other popular recreational species that frequent the Inland Bays like summer flounder, Atlantic croaker, tautog, and the once abundant, but now somewhat infrequent, weakfish (sea trout) to go on the feed prior to moving out of the Inlet to their winter haunts further offshore and south. The tautog will hold tight to the submerged rocks feeding on small crabs and shrimp, whereas the striped bass and bluefish will move around more with the bait fish. Fall is a good time to plan on a fishing trip to Indian River Inlet, but don’t wait too long or you may miss the main offshore migration of both predators and bait. Years ago, it would be 90 degrees — sunny — the quintessential beach day…and you would find me and the neighborhood kids in the woods in our backyard. You see, I grew up locally in a development, but our house was located at the end of a cul-de-sac, and it had the largest, most exclusive wooded lot. (Also, the largest amount of chiggers and ticks per square foot.) But those days arriving to gym class with my legs covered in calamine lotion didn’t matter — we had the trees! My love for forests started then: building forts out of fallen tree branches, waking at sunrise to watch the turkeys and deer emerge from the forest edge, stealing my brother’s paintball guns to dodge each other behind trees, counting all the critters by the creek… I could go on and on! It was the combination of the towering oaks and hickory with the modest holly and trumpet vine growing beneath. It was the ability to look up and see tree canopies sharing the sunlight while beams would playfully hit my face between wind gusts. It was diversity. I (right) planned, coordinated, and assisted with the James Farm Planting on October 4th. Forests need what is called vertical stratification or the development of plants at different heights. Openings in the forest canopy develop naturally as trees die from crowding, attack by insects and disease, or windstorms, ice or other weather events. Gaps in the canopy allow sunlight to reach the forest floor and the mix of light conditions stimulates the growth of new and existing plants. Depending on the light, soil and weather condition, new plant species emerge and, with it, comes new wildlife species. For example, woodpeckers, warblers, Red Eyed Vireo, Scarlet Tanangers and Wild Turkeys prefer older forests between 65-100+ years old. In contrast, Wild Quail, woodcock, cottontail rabbits, and mice prefer younger shrub forests at seedling age. Due to these experiences, I am excited to be a part of diversifying the forest at the James Farm. 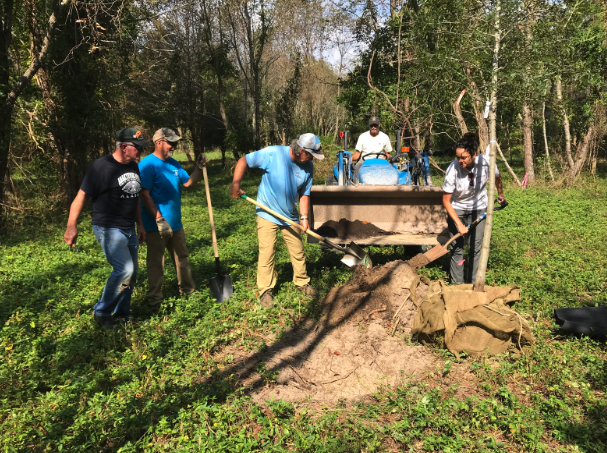 On October 4th, Coastal Gardeners, DNREC staff and James Farm volunteers assisted in planting 22 large, native hardwood trees in a pasture area that has been left fallow since 1998. The new site will be a part of a managed arboretum area of approximately 3 acres, funded by the Delaware Forest Service Urban and Community Forestry Program. Overtime, this area will be a mixed hardwood forest, similar to the other older forests at the James Farm. Hopefully preserve visitors and wildlife alike can enjoy the view for years to come. Check it out when you get a chance! Flounder and Bluefish and Stripers – Oh my! targeting flounder, bluefish, stripers, and crabs. The inlet is fished almost constantly, with lures being thrown into eddies from sun up to sun down – and sometimes, from sun down to sun up! The Inland Bays are indeed a fishing destination for many in the region, but they are not unique in this aspect. Estuaries (those areas where rivers meet the ocean) are extremely productive fishing grounds. And while the public may recognize that the open waters of these bays harbor doormat sized flounder (really!) and delectable blue crabs, few people realize that the shallow shoreline areas are just as important for their fishing success. 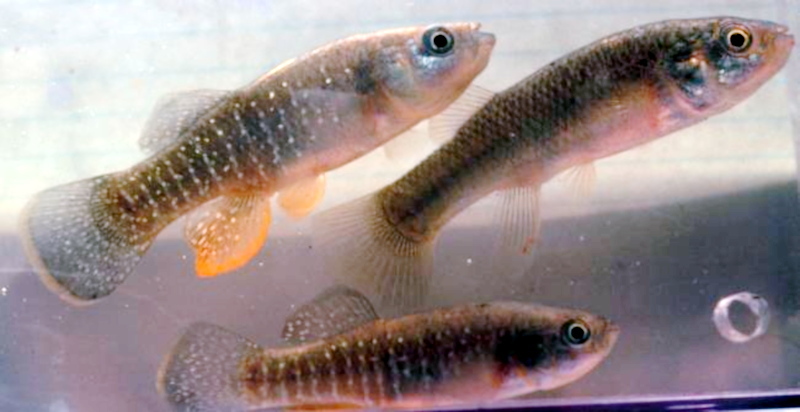 The nearshore waters of the Inland Bays are a critical nursery for countless juvenile fish species. 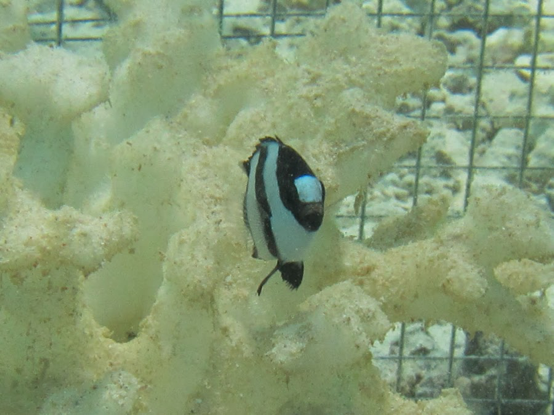 The shallow shoreline waters provide a refuge from predators, creating a safer environment for juvenile fish to grow. With few large predators, and an abundance of food, the shoreline areas of our bays are the perfect nursery. 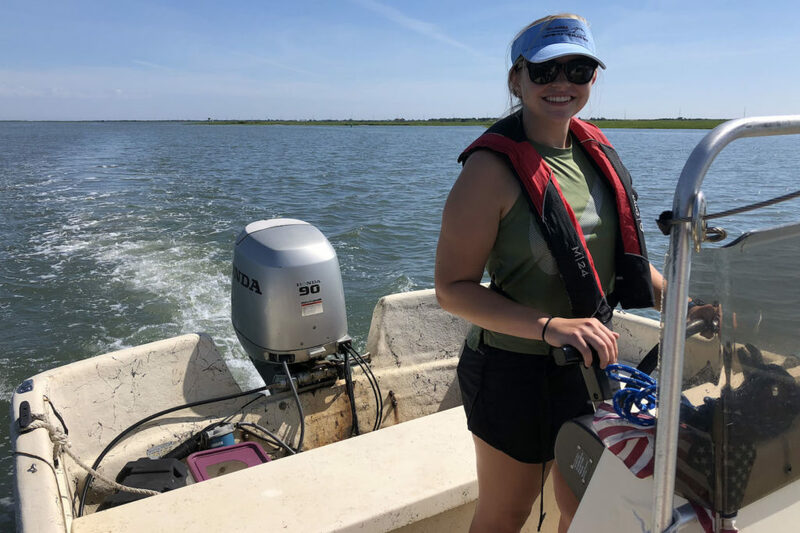 Not only do important recreational species like Summer Flounder and Atlantic Croaker use these shoreline areas as nurseries, but numerous species of small bait fish such as Atlantic Silversides and Atlantic Menhaden do as well. While these bait fish species aren’t caught by anglers, they are immensely important to sustaining the food web and directly serve as a source of food for the more sought after fish like Bluefish and Stripers. The shoreline areas of our bays are home to many weird and wondrous species, such as this Lookdown, being grasped by a blue crab. The amount of fish using these nearshore areas is staggering. 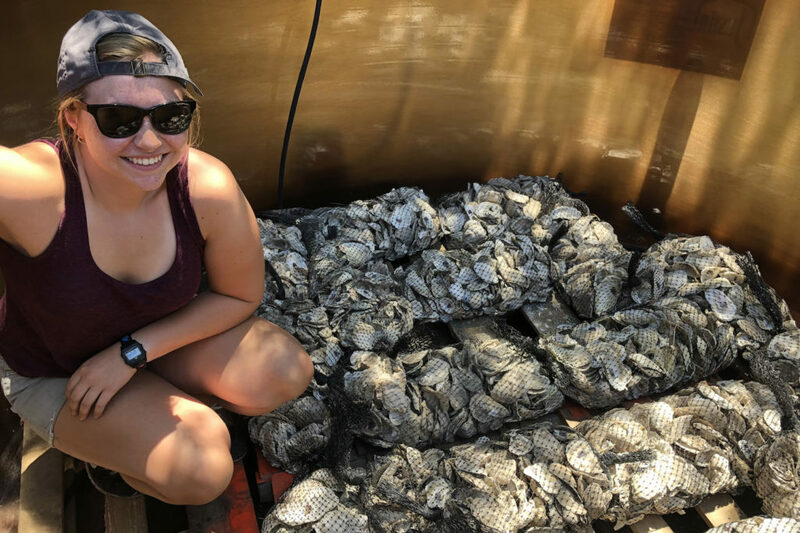 Annually, the Center manages a volunteer-led citizen science Inshore Fish Seining Survey, which samples 16 shoreline sites throughout the Bays, documenting what species are using the shoreline areas and at what sizes. What we’ve seen is that the shoreline areas of our Inland Bays are habitat for over 70 species of fish, and provide a nursery area for both recreationally and ecologically important fish species, not to mention the thousands upon thousands of juvenile blue crabs. It is not uncommon for a single seine to catch over 500 juvenile blue crabs and several thousand fish! And that’s just within a 100-foot section of the shoreline! A haul of several thousand Mummichog and at least several hundred Blue Crabs in the upper Indian River. This is a common haul in these parts. So what can we do to help sustain healthy populations of fish and blue crabs? We can start by preserving our natural shorelines. Research has shown that hardened shorelines like bulkheads and rip rap are not the preferred habitat for many of our inshore fish species. A transition from soft shorelines like marsh edges or sandy beaches to hardened shorelines could negatively impact many of the juvenile fish the food web and anglers rely on. We recommend living shorelines as a solution. Second, we need to reduce the amount of nutrients entering our bays. Excess nutrients can lead to harmful algal blooms, which have the potential to kill fish and crabs. Third, you can join our survey crew and learn more for yourself, while simultaneously helping us gather data. The shoreline areas of our Inland Bays are wondrously diverse and important areas that support mind-blowing amounts of juvenile fish and crabs. And while they don’t get the attention they deserve, they are the secret to our fishing success. 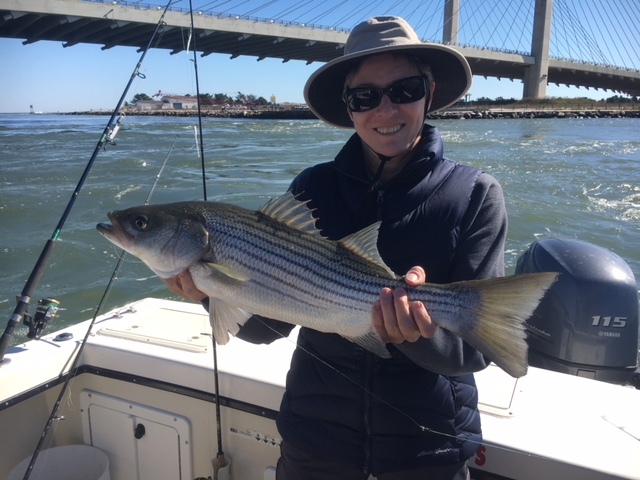 Posted in Staff Blog | Comments Off on Flounder and Bluefish and Stripers – Oh my! I used to migrate between CA and PA. Life changed dramatically when I became a caregiver for my dad who was housebound most of each day. But l was blessed. 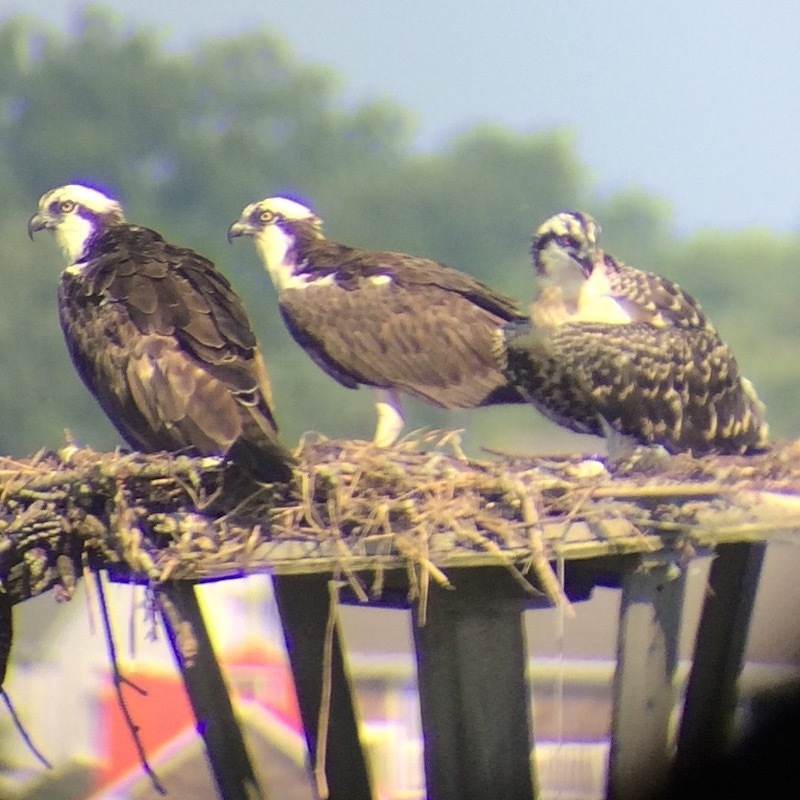 Not only did I get to be with dad all day, we have a colony of 9 osprey nests viewable right outside our windows. When you can watch osprey flying by every window of your house it is not like seeing the random animal run through your yard. You become an osprey junky. You begin to recognize every call they make and you notice their subtle movements on the nest. And so it is that I have now studied osprey for 6 years monitoring over 30 active nests located primarily along the inland bays. I note dates of arrival, egg incubation and hatching, chick fledgling and then, bummer, fall migration. I might not find them as fascinating. Their lives remind me of a romance novel. Imagine this; after a fabulous summer on the Inland Bays dining and sunning with your soul mate, you decide to lift off, free of baggage, bidding goodbye to your home and responsibilities with not one worry. You say “bon voyage” to your mate for 6 months and then lovingly reunite in the spring? Yes, that IS the “Sprey Life”! I generally get a heads up that migration is on the horizon when I see the adult females perching nearby as their mates collect and place sticks on the now empty nests. Ospreys like to leave their homes looking nice for the winter. Never mind the gulls and eagles will move in and make a huge mess. The number one question I am asked is “Where DO the ospreys go in the fall?” They all go south to find food and many will swap their ravenous fish diet from salt to fresh water fish. Adult ospreys have made the roundtrip many times and will follow the same route down the coast of the US, hopscotch across Cuba, Hispaniola, and assorted islands and end up at their favored wintering grounds somewhere in the interior of South America. A few travel as far as Argentina but many go to Columbia, Venezuela and Brazil. Just like our geese there is a resident population of osprey in Florida and rarely a juvenile osprey will stop off there but most osprey that migrate along the eastern flyway of the US continue their travels south across the Caribbean Sea. Paired ospreys do not migrate or winter together. The juveniles born this year will have to find their way south all by their lonesome and they will not return here next year but instead take a gap year and remain south until 2020. Research numbers vary but up to 80% of juveniles do not survive their first year of life as their maiden migration is treacherous. Catching a strong tailwind from the north, adult female osprey are the first to migrate, and will depart sometime by late August. Next the juveniles born this year will take short trips around the area, perfecting their flight and fishing skills, and then usually by mid-September they will meander south finding their own way to a wintering ground that attracts them. The adult males are usually the last to leave. A few may be spotted near their nest as late as the first week of October but many leave before the end of September. Adult males remain behind to care for the juveniles and perhaps to guard their nest territory so long as the other adult males are nearby. Southbound mature ospreys take their sweet time but in the spring they use warp speed to claim their prized northern nest site and reunite with their bonded mate. In a perfect world ospreys can live to 15 years or more and they often bond with a mate and nest for that lifetime. are truly part of your community. 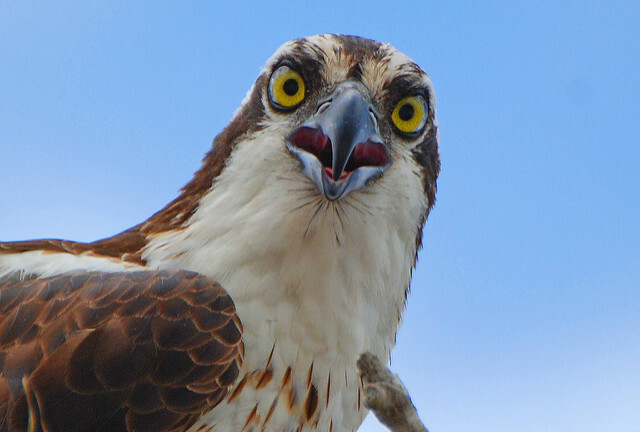 Posted in Staff Blog | Comments Off on Where Do The Ospreys Go In The Fall? You’ve probably been hearing a lot of buzz about floating wetlands lately. That’s because South Bethany is working with us on a project to clean up their canals and we’re using “green” methods to do it! Why do the canals even need help? Healthy waterways can boast clear water with healthy levels of dissolved oxygen that support fish, invertebrates, and other marine creatures. Unfortunately, this is not the case in South Bethany. 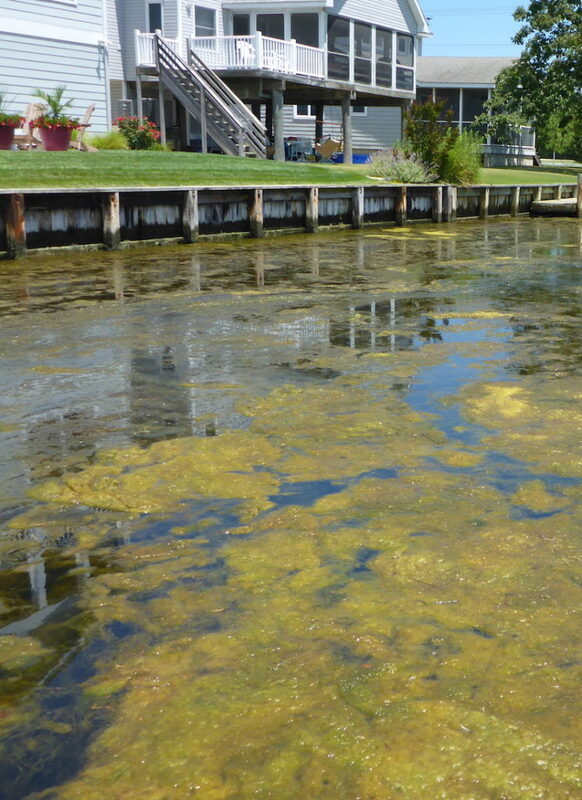 Because there is so much excess nitrogen and phosphorus (collectively known as nutrients) in the canal waters, algae feeds and quickly overwhelms the delicate ecosystem. Then, that same algae which feeds on the nutrients, also “feeds” on the dissolved oxygen in the water. If you want to be technical, the algae actually produce oxygen in daylight, BUT they consume oxygen at night. And as algae dies, bacterial decomposition uses up even MORE oxygen in the water, resulting in extremely low or wildly fluctuating DO concentrations. 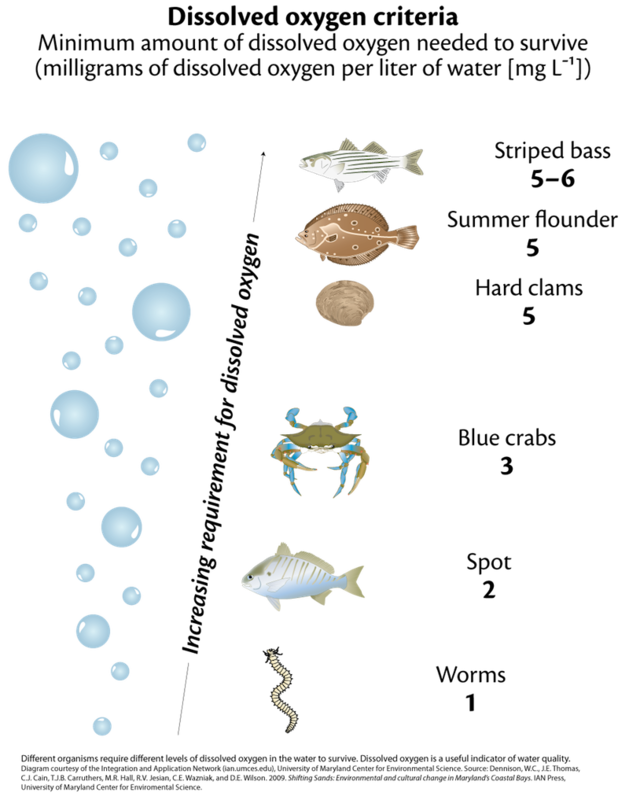 Without enough steady O2, fish, shellfish and other aquatic species are killed off and begin to disappear from the area. 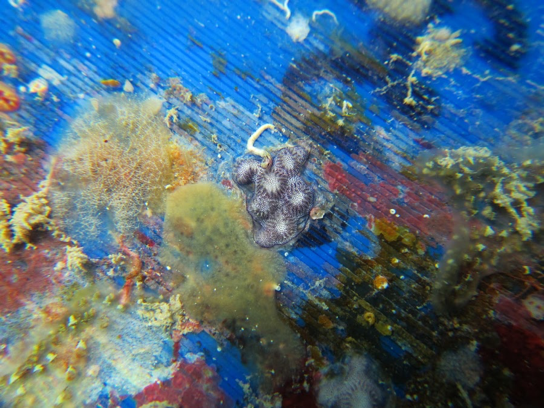 Where is this nutrient pollution coming from? South Bethany, though, has an additional issue to contend with: much of the town was developed prior to the passing of Delaware’s stormwater regulations in 1990. When correctly implemented, these regulations help reduce nutrient pollution from runoff sources — the first two sources from our list above. But since these regulations were not used to design South Bethany specifically, excess nutrients, sediment and bacteria from the area regularly winds up in the residential canal systems. Adding insult to injury, the layout of the canals simply does not allow for the twice-daily tides to flush the polluted waters out into the larger Little Assawoman Bay. South Bethany has been working with the Center for several years on stormwater retrofit projects, including planted median bioswales that capture runoff from the road and filter the water as it seeps into the ground! The floating wetlands are a sister project to these stormwater retrofits that focuses on the water already in the canals. As the name suggests, a floating wetland is a planted, man-made wetland that floats in canals attached to the bulkheads. The plants used, Spartina alterniflora, have their roots dangling in the water where they feed off of the excess nutrients, taking up and binding nitrogen and phosphorus in the plant tissues. The root systems also help the ecosystem by hosting a variety of macroinvertebrates that form the base of a healthy food web. The root systems also act like filters that trap suspended sediment that would otherwise cloud the water. Meanwhile, the plants above the water create a lovely habitat / resting spot for herons,migratory songbirds, monarchs, and other beneficial critters! Over time, we hope to see reduced levels of nutrient pollution, clearer waters, fewer algal blooms, and improved concentrations of dissolved oxygen in the canals. This project was Funded by a Community Water Quality Improvement Grant from the Water Infrastructure Advisory Council, this project will be administered by the Department of Natural Resources and Environmental Control’s Nonpoint Source Pollution Program. 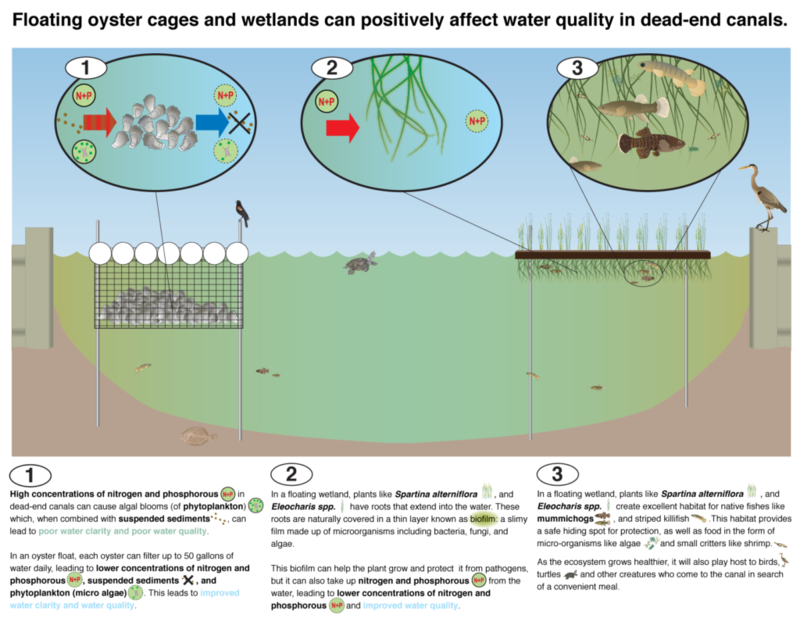 Posted in Staff Blog | Comments Off on Floating Wetlands: Explained! 3 (Super Simple) Ways to Prevent Trash Pollution! Trash in our Inland Bays is SO much more than just an eyesore. It can be harmful to the health and safety of visitors and marine life. 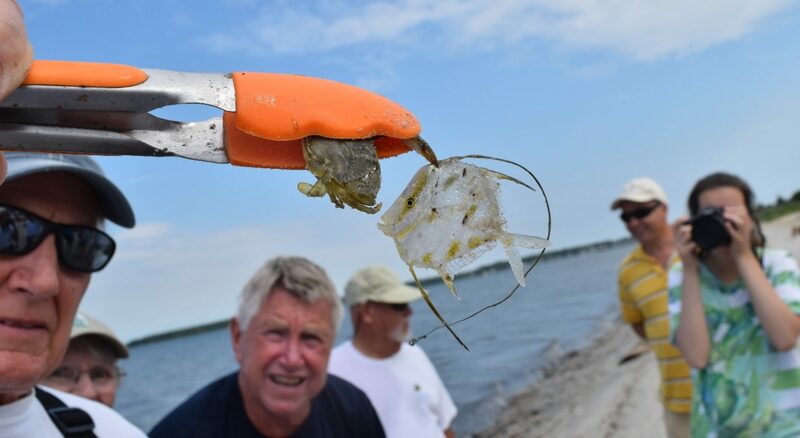 Each year, the Delaware Center for the Inland Bays hosts a cleanup — and it’s always a hit! In fact, this past June saw 54 energetic volunteers who hopped aboard boats and scoured the shores of the Inland Bays. Altogether, they removed a record 2,140 pounds (1.07 tons) of trash! So what was found in the Bays? We collected soda and water bottles, wrappers, straws, shotgun shells, old tires, derelict crab pots, and even docking lumber. Docking lumber you ask? Yep! We believe the bigger stuff is probably washed into the Bays during nor’easters and hurricanes each year. So what can you do to help throughout the year? The Inland Bays are surrounded by a mix of private and public lands, each which have their own rules about trash. But most visitors access the Bays via Delaware Seashore State Park, located off of Route 1. For several years now, Delaware’s State Parks have been “carry in / carry out” facilities, meaning that trash cans are not available and it is expected that you take your trash with you, leaving behind no trace. If this seems like a strange choice, consider this: the policy “remov[ed] trash cans that detracted from the beauty of the natural environment,” and “reduc[ed] the number of bees, wasps and other pests in the picnic areas and campgrounds.” Sounds like a win to me! While this may seem counterintuitive to some, carry in / carry out (loosely related to the “leave no trace” guidelines) it’s a great tool that helps keep public areas clean and it’s nice to use as a general rule of thumb when out in nature. So if you’re spending a day out around the Bays, take an extra bag to keep your trash (or recycling!) home in. Extra kudos to you if you switch to reusable bags, utensils, bottles, etc! it in a proper receptacle after returning to shore. Many of us balk at the idea that people would litter around the Bays and do what we can to pick up after ourselves. But mother nature will always get the best of us puny humans. Whether she knocks your water bottle off of your boat, steals your yard sign, or hurls your private dock into the depths of the Bays (yes, we’ve found that before), it’s always best to prepare for mother nature. Before a nasty storm, bring your smaller lawn items inside and strap down the larger pieces. Have a trash bag on hand on your boat at all times and don’t leave items out. And, whenever possible, weight your lighter items down. You’ll be glad you did and the gulls might not laugh at you the same way they did me. This one is easy to implement: Grab a bag and pick up trash that you see on our bayside beaches. Consider the impact we could have if every visitor to the Bays did this! Keep these few super simple tips in mind on your next trip: the Bays will thank you! Well….maybe not. But I will! When you’re out an about implementing these tips, be sure to take a photo and tag us on Facebook, Twitter, or Instagram and we’ll share it wide and far to encourage other wonderful people like yourself to care for our Inland Bays! Posted in Staff Blog | Comments Off on 3 (Super Simple) Ways to Prevent Trash Pollution!